Quantities: depending on how many people you wish to feed. Chop or shred all the veggies and thyme in the sizes you prefer. You will notice that we did julienne strips or finely chopped the veggies, but as mentioned do what you like. Roll the meat in corn flour, salt and pepper. Fry the meat lightly. Keep aside and then add the veggies bit by bit and fry till done, but it should still be firm. Scoop out of pan/wok and continue with veggies in this manner till all fried. 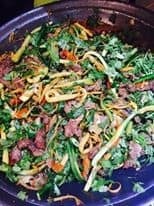 Now combine all veggies and fried meat strips in the wok together with a very generous portion of fresh chopped coriander. Serve with soy sauce or if you like dish up only with rice/noodles and stir-fry.